O Say Can You See, Da Da Da Early Light… | HAIL DUBYUS! 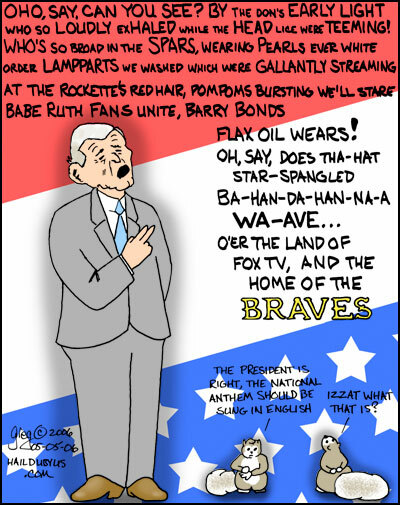 (MENC) STUDY SHOWS AMERICANS DON[base ‘]T KNOW THE NATIONAL ANTHEM “Nearly two out of three Americans (61 percent) don[base ‘]t know all of the words to our National Anthem, the Star-Spangled Banner, according to a recent Harris InteractiveÂ® survey.” Hell, who cares what language it’s in, as long as someone sings it. Let’s give Bush a deal, when he learns to read the calendar so he can figure out when Cinco de Maio (and Chanukah) really are, maybe people will start to pay attention to what he says they should do? Naaaaaaahhhh, he doesn’t even listen to himself, why should anyone else?